There are two contemporary issues in education that are currently having an impact on my practice. This issue is at the forefront of my current practice. It would be fair to say that I have had concerns about this policy from the offset, however, I am now at a place where I have decided the time for angst about it is over and it is time for getting on with the job at hand, and finding work around options for the concerns that still linger. The best way to do that is to get stuck into it and work with my colleagues collaboratively to set a direction. At its best, it is an opportunity for our cluster of schools to collaborate, share our human resources and work on solutions to some of the challenges we face as a wider network and community of learning. In that respect, it is an opportunity. Cross collaboration of ideas, best practice and a real dig into our collective data to see the commonalities and shared challenges we face, and then working together to over come them, has to be something powerful for all of our students: students we all need to have a collective responsibility for. Core Education (2016) has CoLs (as part of networked communities) as one of the top ten trends of 2016. I have sat in two meetings for CoLs in the last two weeks, run by the Ministry, with discourse on effective evaluation from the Education Review Office (ERO). Politics aside, the message around collaboration, shared expertise, and distinct pathways for our students that ensure success, cohesion and strengthened educational outcomes for our students, is hard to argue against. At the moment, my own cluster is exploring the options. We have collective concerns around staffing (explored further in the following section) and philosophical issues still around the apparent restrictive (and uninspired) nature of the achievement challenges. As I see it, setting the achievement challenges is the compliance and accountability aspect. The real ‘rubber hitting the road’ comes from the HOW we work to achieving the challenges. The solution is to see this as an opportunity to be creative, with staffing and professional opportunities, and collectively utilize innovative pedagogies and leadership approaches. This excites me. It will take vision, commitment and quite a bit of imagination to be able to work around the perceived rigidity, but I think it is possible. Of course, I still believe the money could be better spent, but the reality is that that particular horse has well and truly bolted, and now we need to just get on with it and make it work. A growth mindset is most definitely important! 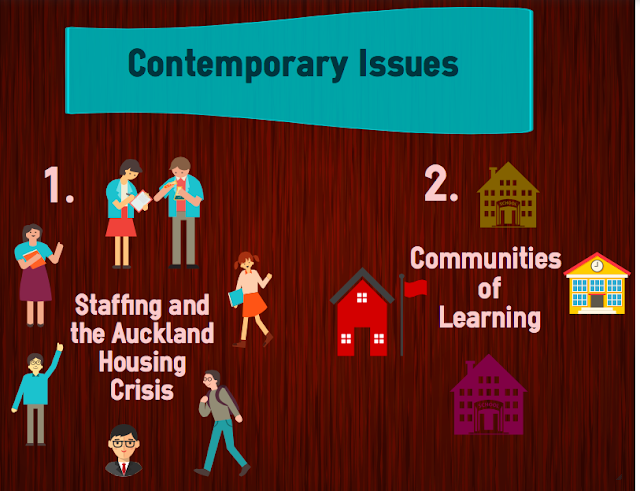 Who would think that the Auckland housing crisis would have a significant impact on schools. Unless you live under a rock in the middle of a far off planet that is not connected to the wider universe and is completely off the technological radar, you would have heard about the Auckland housing crisis. Right now, it is a hot potato topic and not a day goes by without some reference to it in the media. There are many impacts that schools are dealing with in relation to housing (health, transience, poverty and sleeping rough) but those are not the issues I want to deal with in this post. They are important, and are ‘wicked’ challenges to address, but instead, I want to point out a new ‘difficult’ challenge that dominates conversations when I meet with other leaders, and that is the one of staffing. Wicked challenges are ones that are tricky to define and even trickier to solve, difficult challenges however, are ones that are easier understood but illusive to solve (Johnson,L, et al. 2015). In this case, the difficult challenge is the impact the rising cost of the Auckland housing market is having on being able to staff experienced teachers in our schools. I can count on two hands now, how many staff from my school, in the last 18 months, have left for greener (and cheaper) housing pastures in other areas of our beautiful country. My school is not an isolated case – not by a very long shot. Irrespective of which part of Auckland we talk about, losing and subsequently replacing, experienced teachers, is a major issue. It is a very relevant issue for my practice as a leader currently, and will most certainly have a long-term impact on the shape of education in NZ, especially for Auckland. Solution? Given the answer from some quarters who do not think there is an issue because of a large amount of beginning teachers seeking work, is to staff our schools with new graduates, I would like to post a cautionary ‘but wait a moment’ sign post. I mentioned the issue is the loss and subsequent replacement of experienced teachers. If our schools are being decimated by the lack of experience, simply replacing them with new graduates is not a long-term solution. I would hasten to add, what that does, is actually cause a host of more challenges and headaches resulting from a lack of support for these new graduates and that will result in long term and significant disruption. It could work under certain circumstances but that would require some out of the box thinking and could be addressed through a CoL, where mentors could be from within the cluster. Another solution is to have a Working Action Group made up of sector representatives take a good hard look at the issue and come up with a series of different scenarios. As you will have no doubt noticed, both contemporary issues are related. The CoL presents itself as an opportunity, but one of the concerns is that it has the potential to put even more strain on the staffing issues Auckland is currently facing. A possible solution is to employ more graduates, but the flip side is not having enough experienced teachers to mentor them. A possible solution to support new graduates in our schools could actually come from the CoL model. What is certain, is that we will need to look at the contemporary issues our schools are facing and employ some innovative thinking around the solutions as we navigate the future. Hi Steph - enjoyed reading your post and the honest, yet positive approach. These are indeed difficult issues to grapple with and there is not quick fix immediately going to sort it all out. It will take the determined (and visionary) drive and determination of leaders in our schools such as yourself to co-construct the solutions that will work for the benefit of our children and future generations. I particularly like your thinking about supporting graduates within the CoL model - I'd even go further and suggest a more tangible and integrated approach to initial teacher education as a partnership between the providers and schools. EIT have a good example of this happening in the Hawkes Bay region - all 23 graduates last year went immediately into jobs in that area. Thank you Derek - I think it is time we had a good chat with providers and I like your idea - I would be interested in hearing more. We expect our teachers and our students to embrace 21st century thinking when it comes to teaching and learning and so it should be the case with providers and us as well. Coming up with solutions is all about sharing our practice - a collaborative approach to our tricky problems will generate more traction going forward than ignoring it or trying to sort it on our own. Hi Steph, great reading as always. I can appreciate your hesitations around joining and developing a CoL, most schools in our area had the same thoughts, but in the end nearly all jumped on the bandwagon. It has been a difficult process working through the data and setting targets which were relevant and aspirational to all schools especially in an area of diverse equity and student outcomes. You cannot set a target of 85% at or above in maths when one school is already at 88%. I was interested in your comments around innovative practice and how these can be included within a CoL. I can't see this being incorporated within my own one yet as other schools are not on the ILE pedagogy bandwagon. This then poses some interesting consideration when choosing ' a CoL teacher' to work in other schools. What if your pedagogies about how to teacher maths don't align? The CoL is certainly not a quick process both in working with other principals to decide on targets, but also to get approval by the Ministry. I wonder how easy new principals (both first-time and new to the area) will find joining in an already established CoL?